Review posted September 10, 2016. Sterling Children’s Books, New York, 2015. 28 pages. Winifred Schnitzel has monster trouble. It’s not that she’s afraid of them. because Winifred Schnitzel thought monsters were cute. It’s true. 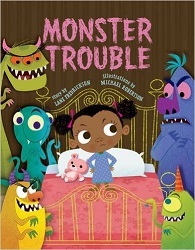 The monsters who show up in Winifred’s house in this book are cute indeed. But scary or not, these monsters make lots of noise. She can’t sleep at night, so she falls asleep during the day. Winifred must do something! Winifred buys a book called Monsters Beware! and tries various tricks to stop the monsters, but none works. Finally, quite by accident, when a monster shows up while she’s dreaming, Winifred learns that the one thing that will frighten monsters away with horror is: Kissing! I cringed a bit when I opened up this book and saw that it was written in rhyme. But the pictures are so much colorful fun and the secret tip given out is so useful to small children afraid of monsters, I was willing to read on and discovered that the rhyme is actually well done and adds to the fun. She was dreaming of puppies when a monster went HISS. She reached out and gave it a big, sleepy KISS. The monster yelled, “Yuck!” All the others were heaving. she’d discovered that monsters have one silly weakness. What's more, I sent my little nieces several picture books I judged for the Cybils last year. This one was Arianna's strong favorite. So this silly book has the approval of a genuine toddler.